On Monday, April 2nd, 2018, First Lady Melania Trump will host the 140th annual Easter Egg Roll on the South Lawn of the White House! The White House Easter Egg Roll is a timeless tradition that dates back to 1878 under the Administration of President Rutherford B. Hayes. President Donald J. Trump and the First Lady are honored to continue the traditions of the past while weaving new traditions into the fabric of our Nation. Families with children 13 years old and younger are invited to join the President, First Lady, White House staff, and their families for a day of festivities. Selection has been made by the lottery system. 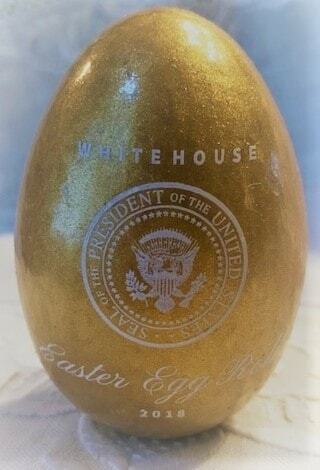 This year's official White House wooden eggs are available in gold, pink, yellow, blue and green. A set of 5 contains all the colors. 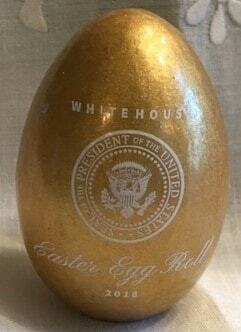 The presidential seal appears on the front of each egg. 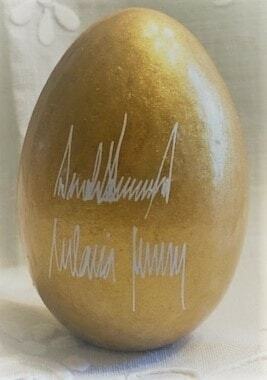 Printed signatures of the Trumps are on the back Gold Egg in Gift Box.